Blaine Christian Church, 7018 Putney Road (corner of Joyfield and Putney Roads), invites all the women in our area to come to the church for their Annual Women’s Retreat on Saturday, November 17, 2018. The retreat begins at 8:45 am and will conclude at 1 pm after lunch is provided. There is a fee of $10 to cover the cost of the retreat. The theme of the retreat is “FEARLESS: It’s Time To Lay Aside That Fear And Step Into The Life You Were Made For”, based on the New Testament verse found in 2nd Timothy 1:7. Special speaker, Lee Nienhuis, is passionate and sincere, and she has a contagious belief that God’s Word still transforms lives today. She has been engaging people through God’s Word for almost two decades. Please call the church, 231/352-9148, by the deadline of Sunday, November 11th to RSVP to insure enough food is available for lunch. When you call, let the church know if you need child care. You and your family are welcome to get to know our church family on Sunday mornings at 8:30 am (contemporary service), or at 11 am (blended service). Separate activities, through “Kid’s Kare”, are provided at each service for children 3 - 6 years old. Sunday School classes for children 2 years old through adults meet at 9:45 am. Copemish Dance with Nelson Road! Rock the night away with Nelson Road! Concession available, $3 beers (Live Music). All proceeds to help with the Post's Renovations. 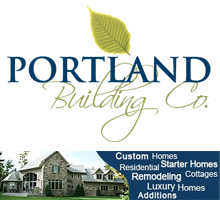 Questions, please call 231-942-8222. American Legion Post 531 and Auxiliary, 18483 Cadillac Hwy., Copemish, MI 49625. Indoor Holiday Art Fair with over 100 artists at Frankfort HS. Santa & Mrs. Claus will be at the Frankfort High School to pass out Complimentary Candy Canes. There will be a Horse-Drawn Carriage Ride and visits with Santa and Mrs. Claus! Come join the fun as we light the Community Tree. Singing, donut holes and hot chocolate to bring the cheer of the holidays. A family friendly event to celebrate the season in choral fastion. A family friendly event to celebrate the season in choral fashion. We host a traditional Candlelight Christmas Eve Worship Service where all are welcome. Open Communion is offered beginning at 6:45 p.m.
We are excited to announce our Valentine's Day Dinner! 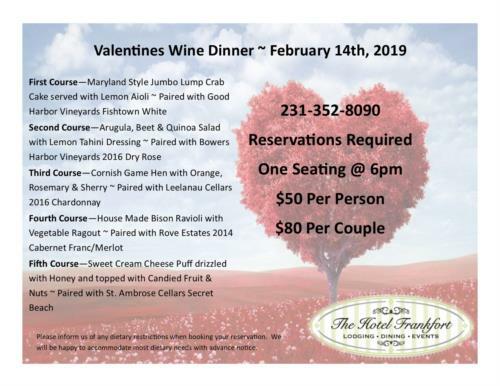 Bring that special someone to The Hotel Frankfort for an exciting evening. The evening’s menu has many local Wines for your enjoyment! Please call us at 231-352-8090 to make a reservation! Please inform us of any dietary restrictions when booking your reservation. We will be happy to accommodate most dietary needs with advance notice.